Say goodbye to boring mashed potatoes! How cute are these beauties? They’d make for an adorable holiday table presentation this year. The best part is, they’re just as easy to make as regular mashed potatoes. If you prefer sweet potatoes, they’d work perfect in this recipe as well — just add a little cinnamon and sugar. Add diced potatoes to a large pot and cover potatoes with cold water. Season water with salt, bring to a boil and cook uncovered until potatoes are fork tender. Preheat the oven to 375. Line two baking sheet with foil. Spread the potatoes out on baking sheets and place into the oven for 12 minutes. Remove the potatoes from the oven and process them in a food processor or stand mixer, until the potatoes resemble chunky mashed potatoes. Add the egg yolks, butter, a large pinches of salt and pepper, chives and milk. Continue to process until to combine until the potatoes becomes smooth. Set aside and allow to cool. Transfer potatoes to a piping bag. Using a star tip, pipe potatoes in a spiral motion onto the baking sheets (kinda like you are piping icing on a cupcake or soft serve ice cream on a cone). 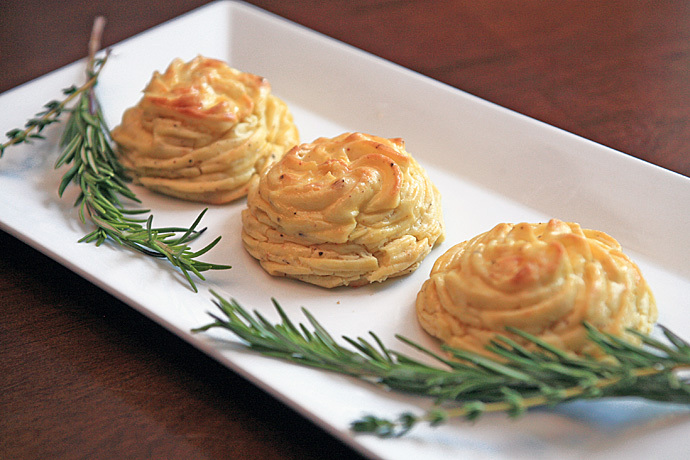 Lightly brush the piped potatoes with the beaten egg to give the whipped potatoes color and gloss. Bake until golden brown around the edges.